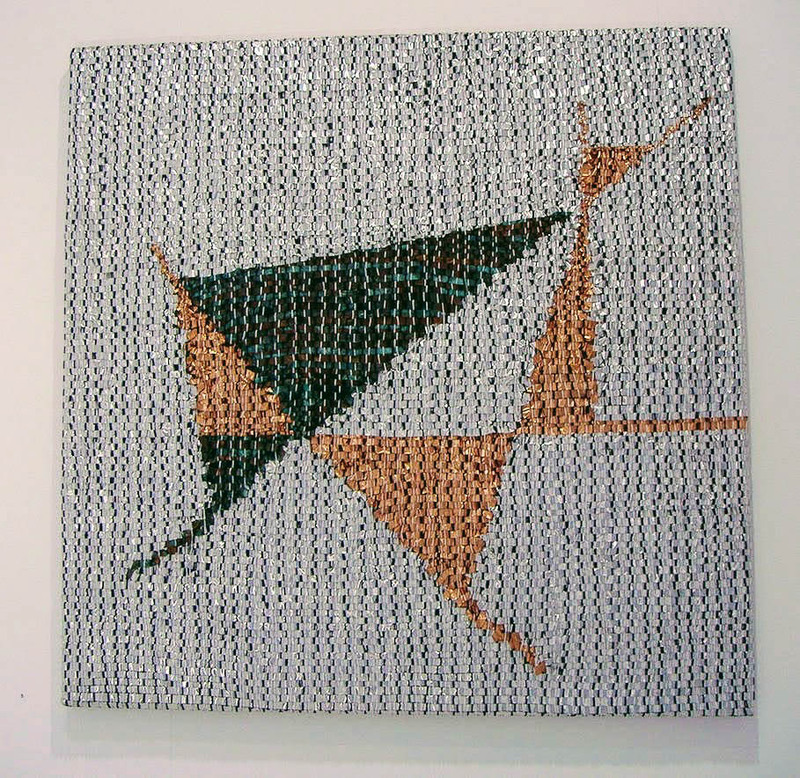 A selection of woven works by the late Margaret Grafton is currently on exhibition until October 14 at SNO – Sydney Non Objective Contemporary Art Projects – in Leichhardt, Sydney. On show are works that reflect the diversity of five decades of practice (1956-2004). 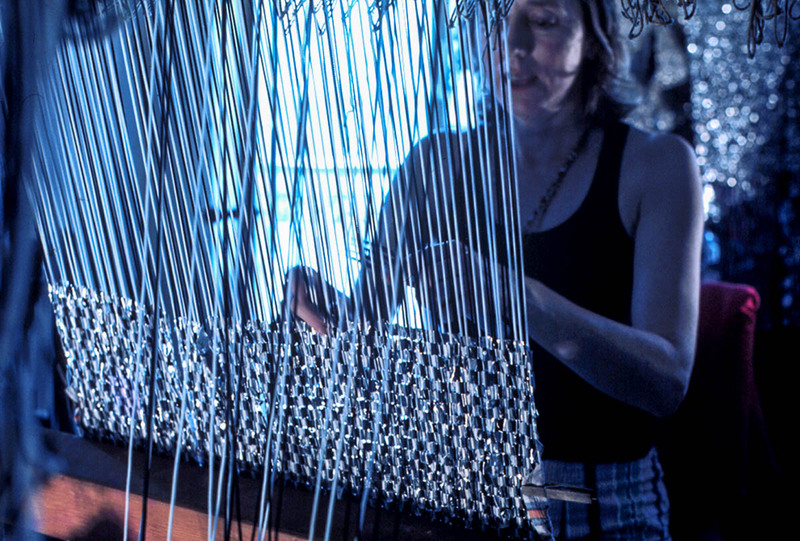 They display assured skill across different materials and styles; weavings in metal, copper, plastics to high-warp tapestry in Swedish and Australian wools, some handspun and naturally dyed in her studio. The exhibition includes the tapestry Lisboa III (1967) based on a painting by her close friend Wendy Paramor. Both artists exhibited at Central St Gallery in the 1960s and early ’70s. Margaret Grafton was an artist-weaver who established her professional tapestry studio in Darlinghurst, Sydney in 1963 and produced many tapestries for public spaces and private collections. Grafton was known for her innovative approach to tapestry making and in particular weavings that interpreted spaces in public buildings designed by leading Sydney architects such as Philip Cox, Andrew Andersons and Peter Johnson. Grafton undertook such commissions and her woven artworks generally – in a manner that showed the potential of weaving as a discipline and artform its own right. A total of 29 commissions were completed from Grafton’s studio and her works are held in the National Gallery of Australia, state-based galleries, museums, and corporate and private collections in Australia, USA, Malaysia and Thailand. Margaret Grafton was a rare combination: artist, activist and philosopher who lived and championed divergent tangents. As I weave the metal forms take on their own positivities and sculptural shape (with the glint of metal and the occasional cut finger) rather than soft and folding woollen tapestry. The grid of woven metal belies the concept-driven artwork; the rationality emboldened here is that of an ancient and complex skill, a medium of technological sophistication and a labour-intensive construction. The aluminium weave retains its glitter through the generations whereas the copper weave, with the action of time upon it, will gradually change from a lustre to a crystallised finish — verdigris — green. The exhibition of Grafton’s woven work at SNO reviews her approach and ideas across the areas of conceptual art, weaving, feminism and philosophy, and looks at the challenges she set, not only to contemporary Australian tapestry practice but art making and public art generally. 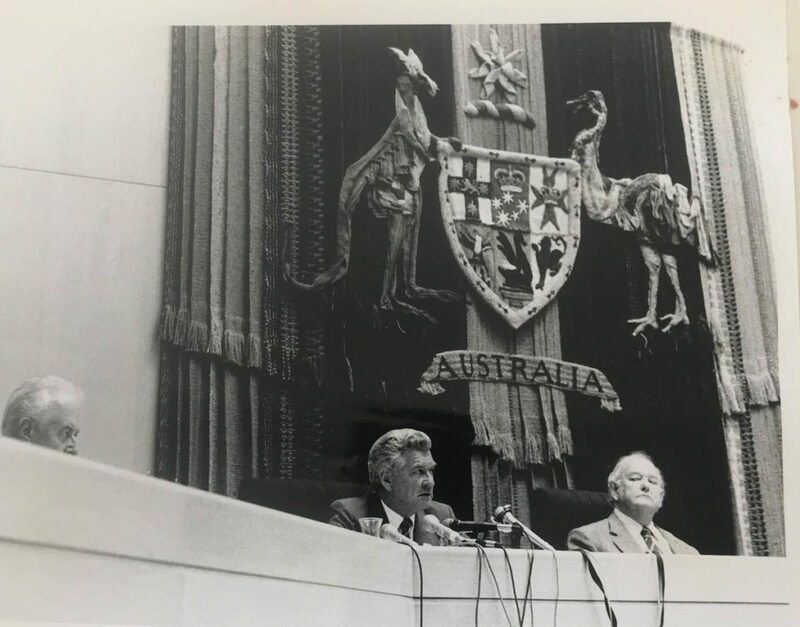 Gough Whitlam, Bob Hawke and Frank Crean at the Federal Court, behind Margaret Grafton’s tapestry. By Beth Hatton, Textile Fibre Forum, Issue 2. No.78, 2005. pp.15-18. Well-known artist and weaver Margaret Grafton had a long and active career spanning nearly fifty years. Her questioning and adventurous spirit can be seen in the experimental qualities of her work which explored a range of materials, forms, techniques and styles. The one constant was her commitment to the weaving process with whose honesty and integrity she felt a deep affinity. Born in Wolverhampton, UK, Margaret Ethel Forster was raised by her grandparents. After studying painting at Wolverhampton College of Fine Art she and her husband Dennis Grafton worked as scene painters for English repertory theatres. Upon migrating to Australia in 1955 the Graftons became immersed in an artistic subculture dominated by male painters, with whom Margaret found little rapport. Inspired by antique Swedish rya rugs, she turned to weaving in 1956. After a short course with Jessica Booth, she focussed on tapestry, teaching herself the techniques as no local practitioners could be found. Fortuitously, her first public commission came in 1963. Architect Philip Cox asked for a 4.88 X 1.83-metre tapestry for the chapel of the C B Alexander College of Agriculture on the Tocal property near Maitland. The brief was to spin the wool, dye it with organic dyes, and create spontaneously on the loom, without a cartoon, in the spirit of the figurative tapestries being woven by the Egyptian children of Harrania. The Tocal tapestry took 15 months to complete and is one of Grafton’s finest works, significant in that it is believed to have been the first tapestry commissioned from an Australian weaver. Until then, commissions had been directed overseas to firms such as Aubusson in France. Cox praised Grafton’s “extraordinary understanding of texture, colour, form” and “her ability to work in total sympathy with her medium”. It was through this project that Grafton met Reverend Douglas Cole, by whom she had her third son Daniel. She moved into the Presbyterian manse at Palmer Street, Darlinghurst where she established her own studio. 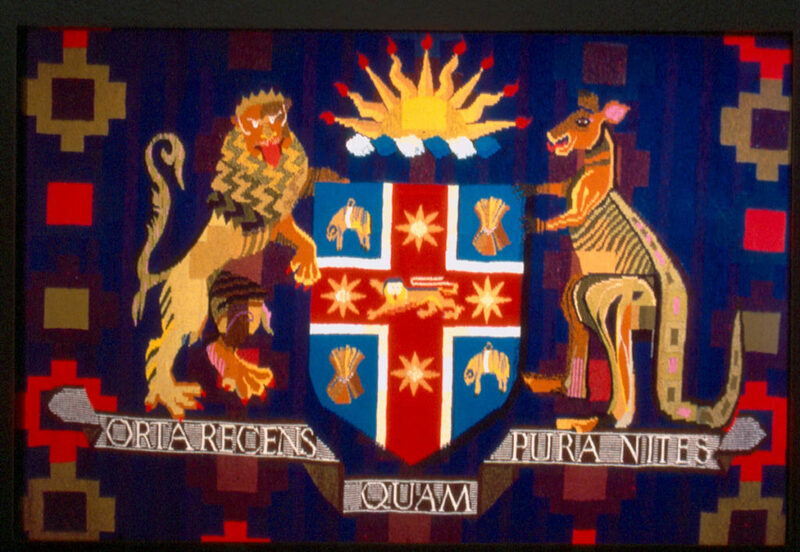 Other commissions followed: tapestries for the Wentworth Hotel (1967), Royal Hospital for Women, Paddington (1968), lawyers Hunt and Hunt (1969), Crafts Board of the Australia Council (1973). 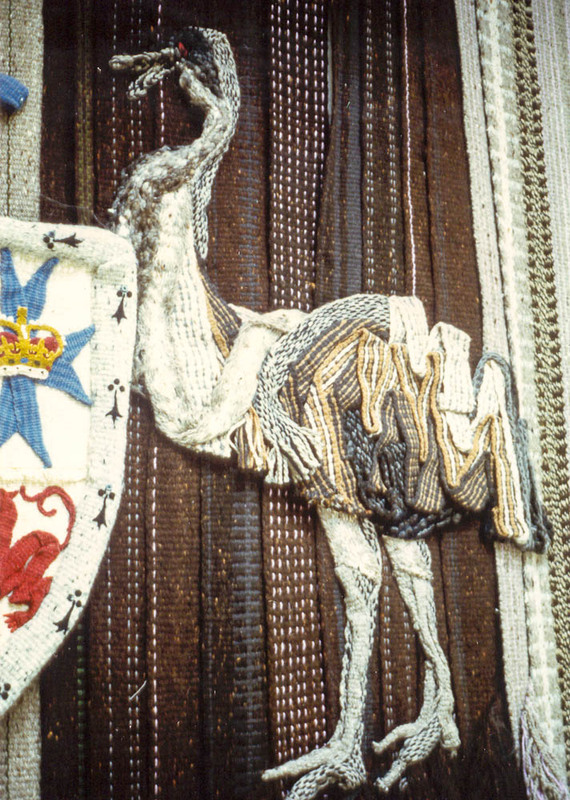 A commission for seven heraldic tapestries for Parramatta Court House (1974) was followed in 1975 by a commission for two tapestries for the NSW Supreme Court. For the Banco Ceremonial Court Grafton first introduced metal into her weaving, using aluminium strips for parts of the coat-of­-arms. This piece proved controversial: Chief Justice Sir Laurence Street objected to the work and would not sit at the bench under it. Eventually, it was rehung in Newcastle courthouse. Of this work, curator Daniel Thomas wrote: “Fantastic…the first silver tapestry I know of anywhere … the silver lightness of the weaving emanates beneficent friendliness, suitably embodying the institute of law and justice”. 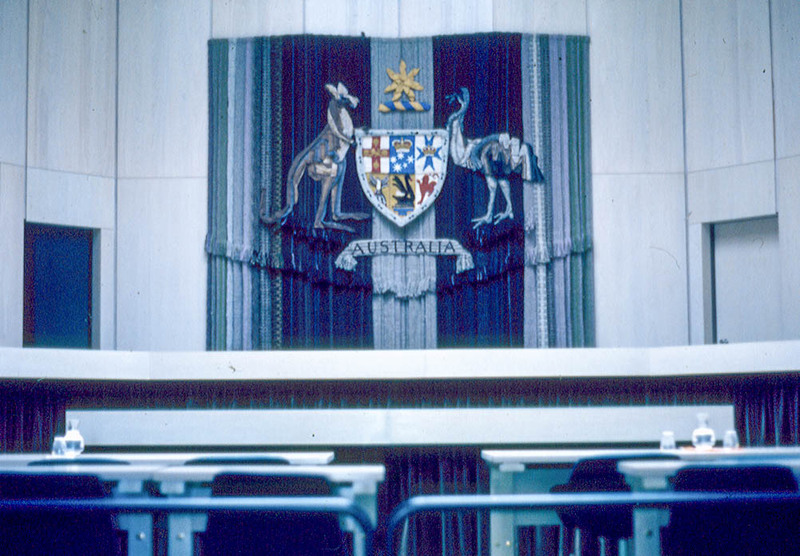 Commissions continued: tapestries for the Blue Mountains District Hospital (1978), Wyong Municipal Council (1979), NSW Parliament House (1980, 1983), Royal College of Pathologists (1980). 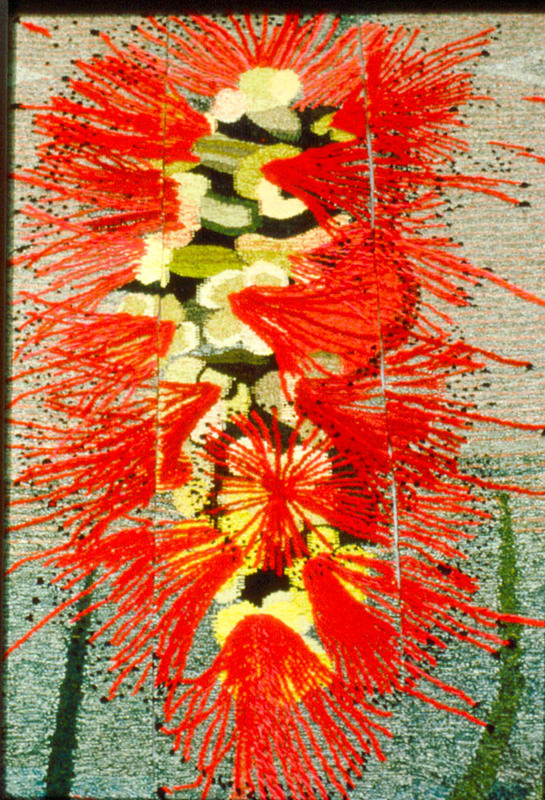 In 1984 Grafton wove her favourite piece, a seven-metre ­long tapestry for Holroyd Community Centre, presenting a bottlebrush flanked by waratah and boronia. Other commissions included tapestries for Ashfield Council (1985), Waverley Municipal Council (1986), Canterbury Municipal Council (1987) and St Vincents Public Hospital (1988). The weaving itself is like a fractious child, one wakes early with it, and attends to it all day: crouching on the floor when it is low on the loom or standing for the hours that it takes to weave a few inches, putting in wool and tapping it into position before beating down the many rows that form a centimetre [of finished weaving]. She has also discussed elsewhere the difficulties of costing labour intensive woven commissions. 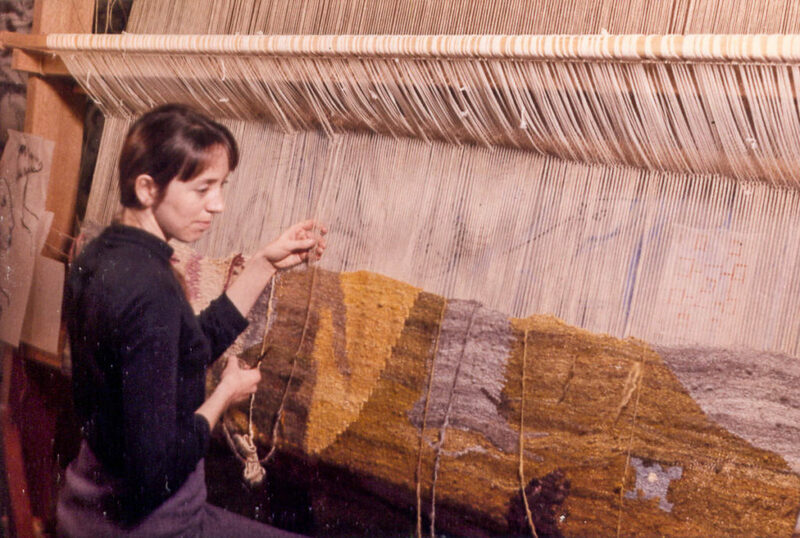 As architecture changed after the 1980s, public commissions declined, perhaps, as Philip Cox suggests, due to the high cost of tapestry making. Grafton herself observed that weaving was seen as “women’s work” and therefore undervalued. However she continued to weave (by now renting a beautiful space at Blackwattle Studios, Glebe), exhibiting in solo and group shows. She had begun in 1976 to study philosophy at the University of Sydney, completing her PhD in 1998. Her studies inspired a series of works on the themes of pre-socratic Greek culture and French deconstructionist philosophy. In 1997-1998 she travelled to Urumqi, China to teach weaving at Xinjiang College of Art. Finding her sample of aluminium weaving made for Banco Court 25 years previously, Grafton became interested in using this metal again. Seeing ancient Chinese copper in an exhibition inspired the purchase of a roll of copper so heavy it had to be lifted with a crane into her home/studio at McElhone Place, Surry Hills. Through experimentation, and the use of other unconventional materials (reflective tape, cord, plastic, cellulose fibre), she developed a series of abstract wall hangings which she exhibited from 2001 onwards at the Sydney outlet Planet Furniture. She produced a series of metal weavings for the Wentworth Hotel as well as a number of commissions for the firm Graphis. In 2003 Grafton was invited to participate in a three-woman show at Bathurst Art Gallery, presenting work combining a strong conceptual basis with commitment to process. She created large metal hangings in a range of geometric shapes, and began to draw and engrave images of native grasses onto plastic and metal strips. Her death prevented completion of some pieces, but enough were finished to enable the exhibition to proceed (9 December 2004 – 16 January 2005). Looking at Grafton’s achievements over 73 years, at the top of the list must be the raising of three boys on her own, supporting them mainly with earnings from commissions. She was a committed feminist, prolific tree planter and active in community concerns. Son Julius recalls that she was secretary of the Darlinghurst Residents Action Group in the 1970s, working alongside Jack Mundy, Wendy Bacon and Juanita Nielsen, championing the Green Bans which saved so much inner city housing from demolition. [Her son Julius wrote] Despite her best endeavours she failed to get arrested protesting her cause, even in the infamous showdown at Victoria Street. Despite other commitments, her career and practice continued developing. Besides being represented in three public collections (National Gallery of Australia, Tamworth City Gallery, Jewish Museum Melbourne), from 1963 to 1988 she completed 29 works for public buildings across NSW. This was at a time when the Victorian Tapestry Workshop (established 1976) had embarked on a different way of working, translating the paintings of famous artists into weavings. Grafton objected to the dichotomy which this represented, the opposition of design versus weaving, which she felt transformed the weaver into servant of the design. Alarmed at the diversion of public funding towards “name” painters wanting to get their works woven, she urged a re-emphasis on weavers in their individual studios producing “integral works of woven art”. Grafton treated the constraints of commissions as creative opportunities, viewing each design brief as a challenge to develop original interpretations expressive of the artist­-weaver’s process. 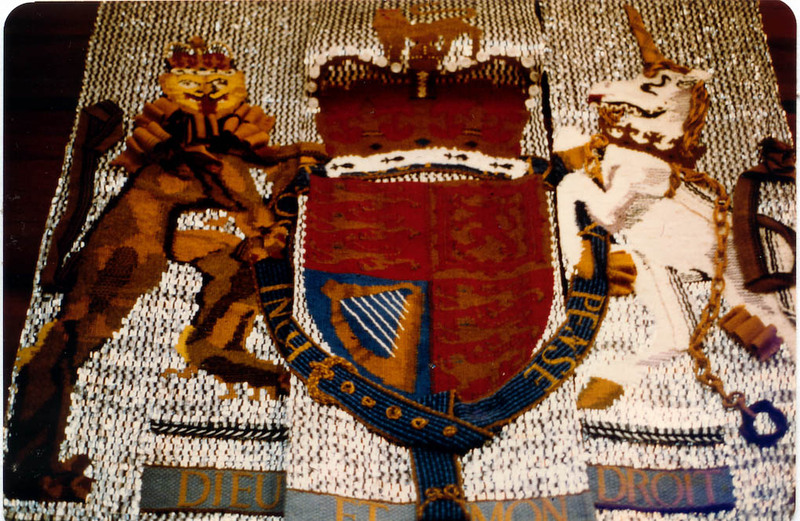 For example, each coat-of-arms tapestry used different weaving conventions. One accentuated the slits in kilim weaving, another presented the coat-of-arms within the rich texture of pile weave, traditional kilim patterns appeared as background motifs in another and, of course, aluminium strips were used in the controversial Banco Court tapestry. 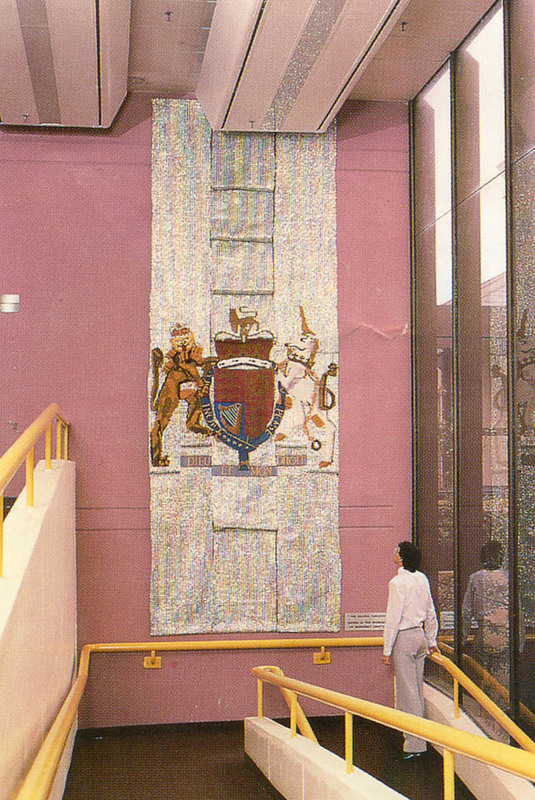 She was fond of the Navajo technique of wedge weave, demanding to do but visually impelling, and used it in several commissions to great effect, such as the bottlebrush tapestry for Holroyd Community Centre. …the image on paper is a shadowy reflection of something that stirs from the woven experience. The project of an “image weaver” is to pursue that reflection, to tie it (a suitable phrase), where it can’t escape, and to do this one has a rich panoply of colours, textures and techniques at one’s disposal. Her passionate commitment to the language of weaving, and her ability to embrace change within the course of a long and productive career,are among her finest achievements. The Tocal Tapestry, near Maitland NSW. By Margaret Grafton (1964). 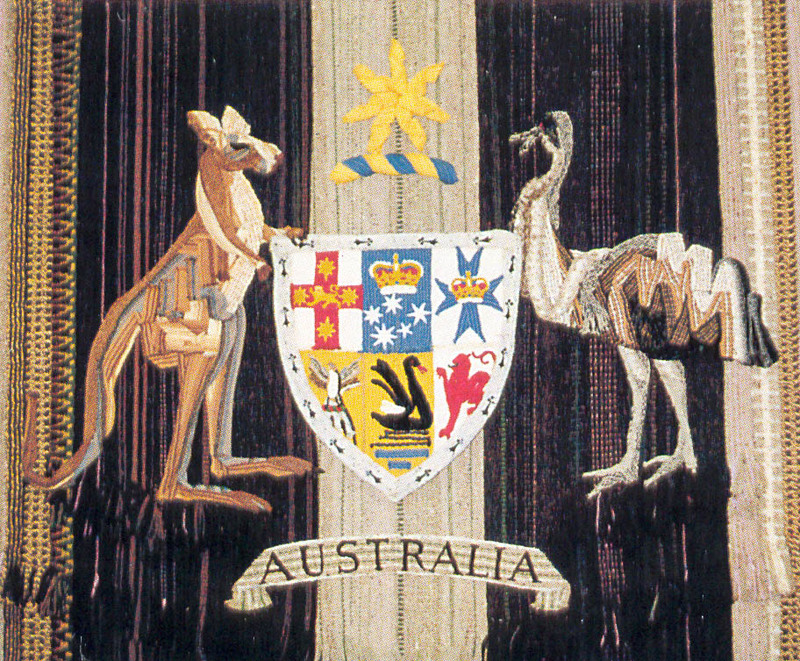 This was the first Australian tapestry to be commissioned by an architect for a site-specific project and was instrumental in establishing the incorporation of art works into large-scale projects as common practice. Made of handspun wool dyed with natural dyes, it took 18 months to complete. Philip Cox advised the commission of Margaret Grafton for the chapel’s alter tapestry saying later “I believe many would argue… the tapestry is almost a ‘Bayeux’ of its kind.” Further reading on the commissioning of the work and college history here. Thanks to Daniel Grafton for assistance with this article.